The minimum temperatures from June until mid September were generally higher than in recent years, indicative of relatively less PSC area from August through mid September. Beginning in mid September the PSC area stabilised at more typical values before it decreased very rapidly in mid October. Remarkably, lower temperatures were observed in the lower stratosphere during early November with some increase in PSC activity near the bottom of the vortex. This year’s polar vortex area was typical of the past decade. 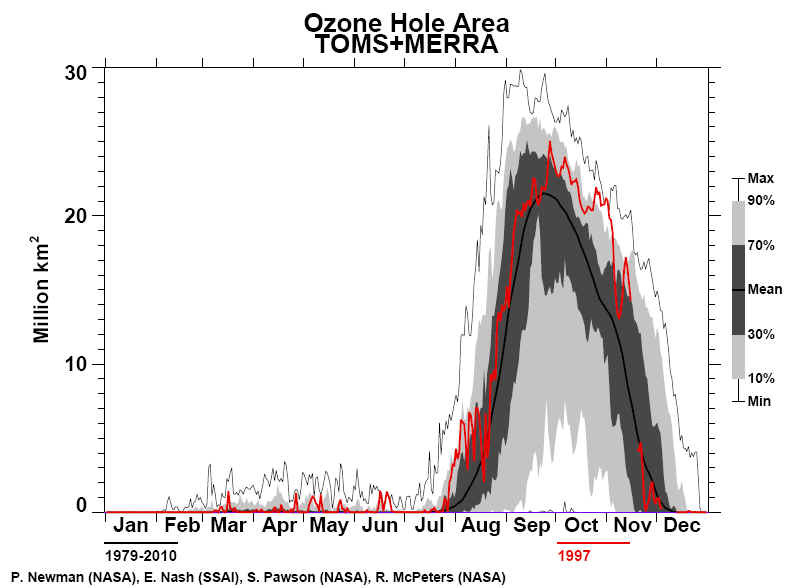 In September and November the ozone hole was smaller than 1996, although similar in size during October. 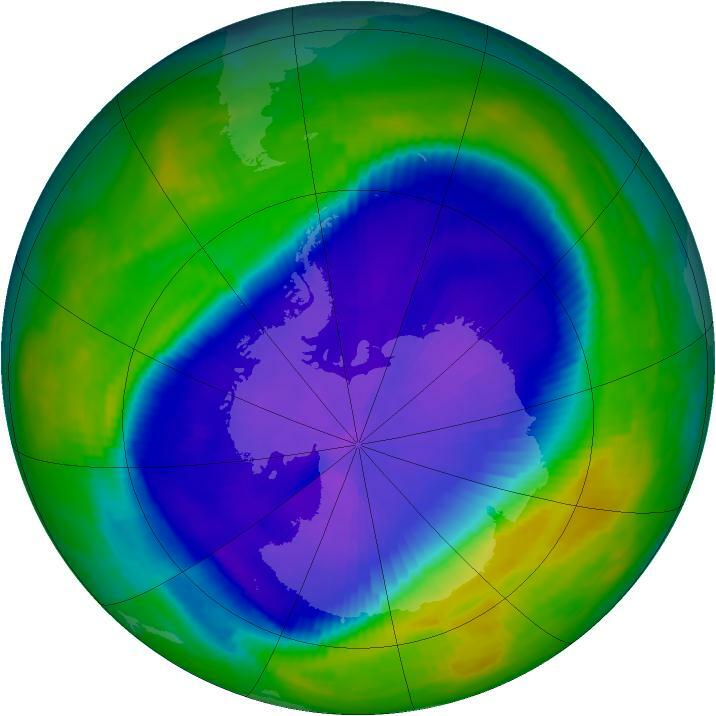 The ozone hole dissipated in late November after a fast decrease in the middle of the month. This was the earliest dissipation since 1991, although the ozone hole was quite deep. In late September and early October ozone values over a broad area of Antarctica were 50% and sometimes more than 60% below pre-ozone hole norms. Furthermore, the area with ozone values of more than 50% deviation was similar to 1995 and 1996 from late September until late October. Also the high latitude zonal averages during September and October were smilar to 1996. As in 1995, some ground based stations reported their lowest daily values ever. 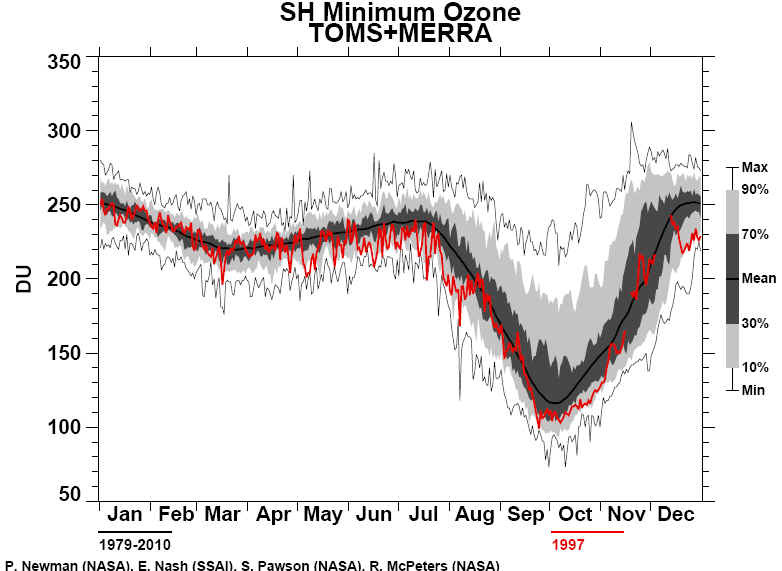 Through mid October the ozone hole was somewhat elongated and then became more circular. As in 1996, "mini holes" appeared around the Antarctic continent in early August. Due to the elongated vortex stretching toward South America, unusually low ozone was observed frequently over its southern tip. On four days during the first half of October Ushuaia measured ozone hole values and on 14 October ozone values of 45% below pre-ozone hole norms were observed. Between the last days of October and mid November this region was again at the edge of the ozone hole and sometimes under it, measuring average ozone values up to 35% below pre-ozone hole norms during the first 20 days of November. Due to a "mini hole" in early August, most of New Zealand had ozone values 30% below normal and southern Australia observed 20% deviation for a few days. During September and October low ozone values appeared again over southern New Zealand for a total of six days and for one day over Tasmania. British Antarctic Survey summary 1997-Overall the 1997/98 ozone season was comparable to those of recent years, with minimum ozone values of around 110 DU at Halley. The spring warming took place slightly earlier than in the past two years, leading to a higher annual mean. The January and February means for Vernadsky were the lowest on record. The 100 hPa temperature over Halley and Vernadsky was below the long term mean for most of the season.Total ozone values fell from an estimated 300 DU in early July to around 200 DU in mid August. Values rose to around 240 DU towards the end of August but then steadily fell to reach 115 DU in early October. Ozone values rose to around 160 DU late in October and remained near this value until mid November when the spring warming started. Values peaked at just under 300 DU in early December, compared to the long term mean peak of 380 DU. Summer values declined to a plateau in early January at around 260 DU. Daily variation began to increase at the beginning of March, although mean values have changed little. 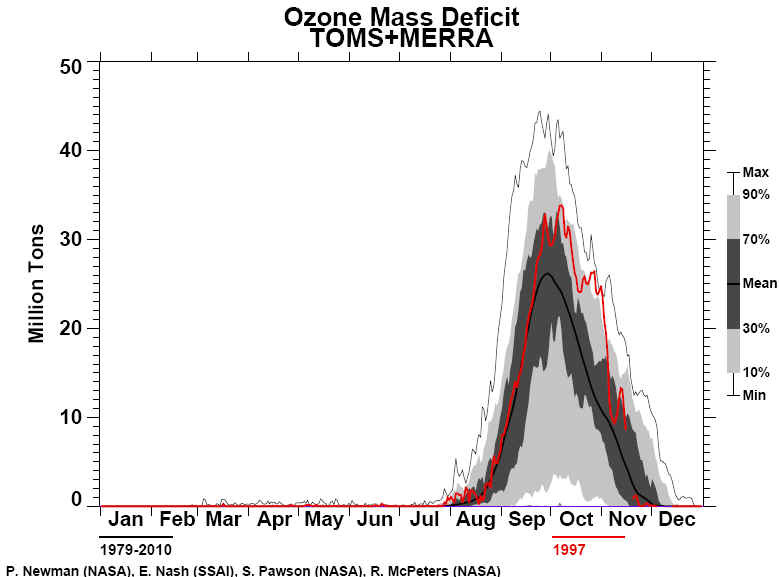 Ozone values remained significantly below the long term mean throughout the year.